Paths represent the geometry of the outline of an object, defined in terms of moveto (set a new current point), lineto (draw a straight line), curveto (draw a curve using a cubic Bézier) and closepath (close the current shape by drawing a line to the last moveto) elements. Compound paths (i.e., a path with multiple subpaths) are possible to allow effects such as "donut holes" in objects. 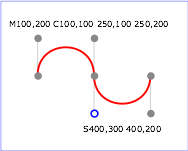 This chapter describes the syntax and behavior for SVG paths. Various implementation notes for SVG paths can be found in 'path' element implementation notes. The definition of the outline of a shape. See Path data. An empty attribute value (d="") disables rendering of the element. The lacuna value is the empty string. Animatable: yes, but see restrictions described in Animating path data. The authoring length of the path, in user units. This value is used to calibrate the user agent's own distance-along-a-path calculations with that of the author. The user agent shall scale all distance-along-a-path computations by the ratio of 'pathLength' to the user agent's own computed value for total path length. 'pathLength' potentially affects calculations for motion animation and various stroke operations. A negative value is an unsupported value. Interpolated path data animation is only possible when each normalized path data specification within an animation specification has exactly the same list of path data commands as the 'd' attribute after normalization. This means that each path data specification and the 'd' attribute would have the exact same list of commands if normalized as defined in Path Normalization. If an animation is specified and the list of path data commands is not the same, then the animation specification must be ignored as unsupported. The animation engine shall interpolate each parameter to each path data command separately based upon the attributes on the given animation element. Non-interpolated (i.e. calcMode="discrete") path data animation is always possible. A path is defined by including a 'path' element which contains a 'd' attribute, where the 'd' attribute contains the moveto, line, curve (both cubic and quadratic Béziers) and closepath instructions. 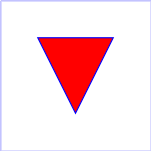 Example 08_01 specifies a 'path' in the shape of a triangle. (The M indicates a moveto, the L's indicate lineto's, and the z indicates a closepath). Path data can contain newline characters and thus can be broken up into multiple lines to improve readability. Superfluous white space and separators such as commas can be eliminated (e.g., 'M 100 100 L 200 200' contains unnecessary spaces and could be expressed more compactly as 'M100 100L200 200'). The command letter can be eliminated on subsequent commands if the same command is used multiple times in a row (e.g., you can drop the second "L" in 'M 100 200 L 200 100 L -100 -200' and use 'M 100 200 L 200 100 -100 -200' instead). For the relative versions of the commands, all coordinate values shall be relative to the current point at the start of the command. Coordinates following commands in uppercase (e.g., M) shall be treated as absolute coordinates. Coordinates following commands in lowercase (e.g., m) shall be treated as relative coordinates. m (relative) moveto (x y)+ A new sub-path at the given (x,y) coordinate shall be started. This shall also establish a new current point at the given coordinate. If a relative 'moveto' (m) appears as the first element of the 'path', then it shall treated as a pair of absolute coordinates. If a 'moveto' is followed by multiple pairs of coordinates, the subsequent pairs shall be treated as implicit 'lineto' commands. A straight line shall be drawn from the current point to the initial point of the current subpath, and shall end the current subpath. If a 'closepath' (Z or z) is followed immediately by any other command, then the next subpath must start at the same initial point as the current subpath. When a subpath ends in a 'closepath', it differs in behavior from what happens when "manually" closing a subpath via a 'lineto' command in how 'stroke-linejoin' and 'stroke-linecap' are implemented. With 'closepath', the end of the final segment of the subpath shall be "joined" with the start of the initial segment of the subpath using the current value of 'stroke-linejoin'. If instead the subpath is closed "manually" via a 'lineto' command, the start of the first segment and the end of the last segment are not joined but instead shall each be capped using the current value of 'stroke-linecap'. At the end of the command, the new current point shall be set to the initial point of the current subpath. z closepath (none) The current subpath shall be closed by drawing a straight line from the current point to current subpath's initial point, which then shall become the new current point. Since the Z and z commands take no parameters, they have an identical effect. l (relative) lineto (x y)+ A line shall be drawn from the current point to the given (x,y) coordinate, which then shall become the new current point. If more than one coordinate pair is specified, a polyline shall be drawn. At the end of the command, the new current point shall be set to the final set of coordinates provided. h (relative) horizontal lineto x+ A horizontal line shall be drawn from the current point (cpx, cpy) to (x, cpy). If more than one x value is specified, multiple horizonal lines shall be drawn (although usually this doesn't make sense). At the end of the command, the new current point shall be (x, cpy) for the final value of x.
v (relative) vertical lineto y+ A vertical line shall be drawn from the current point (cpx, cpy) to (cpx, y). If more than one y value is specified, multiple vertical lines shall be drawn (although usually this doesn't make sense). At the end of the command, the new current point shall be (cpx, y) for the final value of y.
c (relative) curveto (x1 y1 x2 y2 x y)+ A cubic Bézier curve shall be drawn from the current point to (x,y) using (x1,y1) as the control point at the beginning of the curve and (x2,y2) as the control point at the end of the curve. If multiple sets of coordinates are specified, a polybézier shall be drawn. At the end of the command, the new current point shall be the final (x,y) coordinate pair used in the polybézier. s (relative) shorthand/smooth curveto (x2 y2 x y)+ A cubic Bézier curve shall be drawn from the current point to (x,y). The first control point shall be the reflection of the second control point on the previous command relative to the current point. (If there is no previous command or if the previous command was not an C, c, S or s, the first control point shall be coincident with the current point.) (x2,y2) shall be used as the second control point (i.e., the control point at the end of the curve). If multiple sets of coordinates are specified, a polybézier shall be drawn. At the end of the command, the new current point shall be the final (x,y) coordinate pair used in the polybézier. Example 08_02 shows some simple uses of 'Cubic Bézier' commands within a 'path'. Note that the control point for the "S" command is computed automatically as the reflection of the control point for the previous "C" command relative to the start point of the "S" command. <text font-size="22" font-family="Verdana" x="325" y="350"
q (relative) quadratic Bézier curveto (x1 y1 x y)+ A quadratic Bézier curve is drawn from the current point to (x,y) using (x1,y1) as the control point. If multiple sets of coordinates are specified, a polybézier shall be drawn. At the end of the command, the new current point shall be the final (x,y) coordinate pair used in the polybézier. t (relative) Shorthand/smooth quadratic Bézier curveto (x y)+ A quadratic Bézier curve is drawn from the current point to (x,y). The control point shall be the reflection of the control point on the previous command relative to the current point. (If there is no previous command or if the previous command was not a Q, q, T or t, the control point shall be current point.) If multiple sets of coordinates are specified, a polybézier shall be drawn. At the end of the command, the new current point shall be the final (x,y) coordinate pair used in the polybézier. 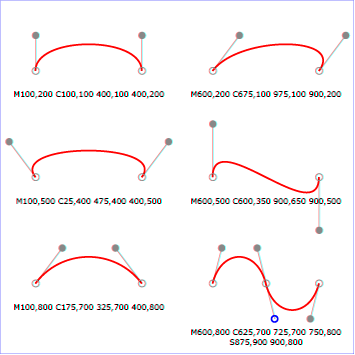 Example quad01 shows some simple uses of 'Quadratic Bézier' commands within a path. Note that the control point for the "T" command is computed automatically as the reflection of the control point for the previous "Q" command relative to the start point of the "T" command. Note that the EBNF allows the path 'd' attribute to be empty. This is not an error, instead it disables rendering of the path. Values of the 'd' that do not match the EBNF are treated as unsupported. Various operations, including motion animation and some stroke operations, require that the user agent compute the distance along the geometry of a graphics element, such as a 'path'. To aid hand authoring by allowing convenient round numbers to be used, the 'pathLength' attribute can be used to provide the author's computation of the total length of the path so that the user agent can scale distance-along-a-path computations by the ratio of 'pathLength' to the user agent's own computed value for total path length. A "moveto" operation within a 'path' element is defined to have zero length. Only the various "lineto" and "curveto" commands contribute to path length calculations.